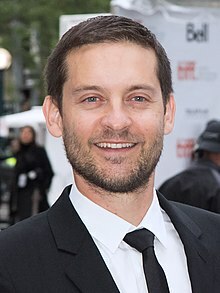 Tobias Vincent "Tobey" Maguire (born June 27, 1975) is an American actor and producer. He is known for playing the title character in Sam Raimi's Spider-Man film trilogy (2002, 2004, and 2007), as well as for his roles in Pleasantville (1998), The Cider House Rules (1999), Wonder Boys (2000), Seabiscuit (2003), The Good German (2006), Brothers (2009), and The Great Gatsby (2013). I’ve been a vegetarian for 14 years now, and a lot of the time I avoid going to restaurants. I eat at home. … I’ve never had any desire to eat meat. In fact, when I was a kid I would have a really difficult time eating meat at all. It had to be the perfect bite, with no fat or gristle or bone or anything like that…. I don’t judge people who eat meat—that’s not for me to say—but the whole thing just sort of bums me out. "Tobey Maguire - Web Exclusive", interview in Parade.com (1 April 2007). Quoted in "The Green Quote: Tobey Maguire Prefers To Eat At Home", in Ecorazzi.com (24 July 2008).